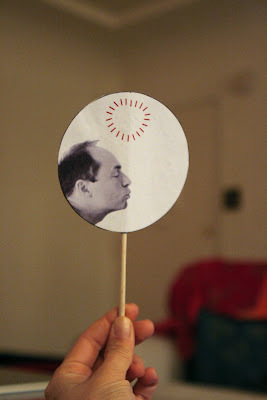 A few years ago, I thought that it would be so fun to make Joe a kissing thaumatrope for Valentine's Day. Like so many of my BRILLIANT ideas, I promptly forgot all about it. 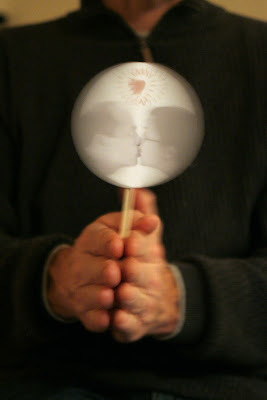 Until recently, when I saw this thaumatrope-on-a-stick on Made by Joel, and it reminded me that I had to try it. Even though they're not done, I'm showing you my work in progress now, just in case you want to use this idea to make your very own thaumatrope valentines. Are you wondering what I am talking about? Movie magic! Persistence of vision!!! Kissing!!!!! Does it get any better than this? 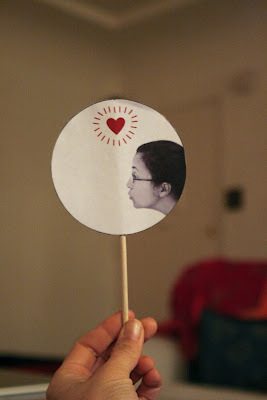 I'm making some for my three little Valentinos, too. Isn't it funny that no one in my family even asked what I was doing when I said, "Here, stand against the wall and let me take a picture of you kissing something." They all just did it. If you do make your own, please send me a picture! Wouldn't they make sweet wedding invitations or favors? Materials: Paper, cardboard, double-stick tape or glue, round chopstick or kebab stick, photo prints or drawings of kissers in profile. Line them up carefully so that they work together when you spin the stick, and test it out before you glue! This is the best Maiz! I have to make one! Amazing how you captured it in the third photo! Isn't it true.. the best ideas are the ones where you find yourself saying.. now why didn't i think of that! seems really hard to make them both aligned just so they look like they're kissing and not crossing each other or being too far away though! I absolutely love this! I so have to try it! And I'm glad you explained because I had no idea what a thaumatrope was! i want to do this with my students! Everyone I show this to says, "Awwwww!" that is SO CUTE. i NEED to make one of me and my husband. & my husband thought I was being so silly at first. Until he saw how magical it was. I definitely must try it. Hi! I love this and would like to create one for my daughter who is getting married in Oct. I'm wondering if I'm on the right track in thinking about the construction.... can I just take a picture of them kissing against a blank background, cut it in half and then reproduce the pics on a circle? Maybe decorate each a little like you did? Does that sound right? c'est excellent ! BRAVO j'aime beaucoup ! Thank you from pAris, France!! !